Data standards are becoming a hot topic in the UK healthcare community as people begin to recognise that improving the procurement process can reduce costs across the system. As pressure increases to reduce the cost of healthcare without compromising patient outcomes, data standards become a more relevant and significant solution. 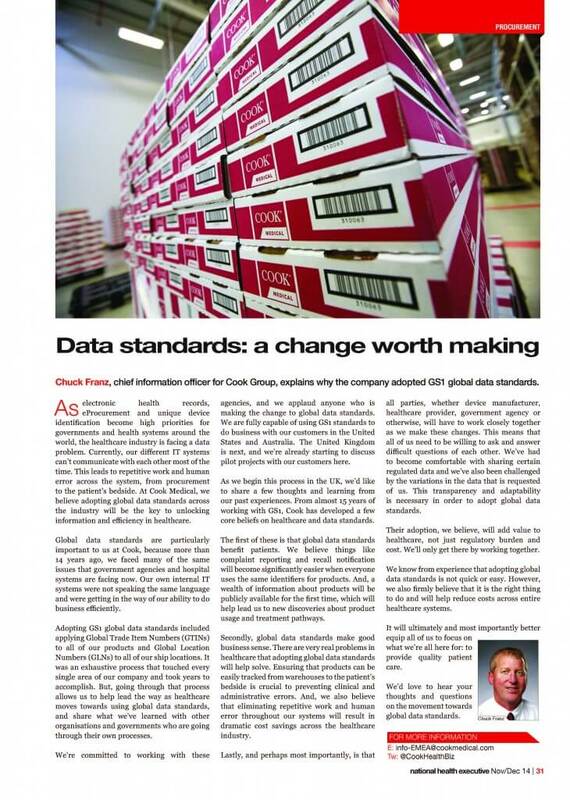 Recently, Cook’s chief information officer, Chuck Franz, discussed data standards adoption in National Health Executive magazine. We firmly believe in the benefits of data standards. They are good for patient care, and they make good business sense. We know this from experience. However, a radical change like this requires cooperation from all parties in healthcare. Suppliers and providers need to work together in ways that are new to the industry. Read Chuck’s article below. Is your organisation or trust adopting data standards? We want to hear about your experience. Join the conversation on Twitter @CookHealthBiz.